Drug buffer solutions were placed into the GIT of an in situ rat preparation. 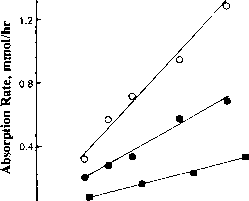 The apparent first-order absorption rate constants are based upon drug disappearance from the buffer solution. 1. 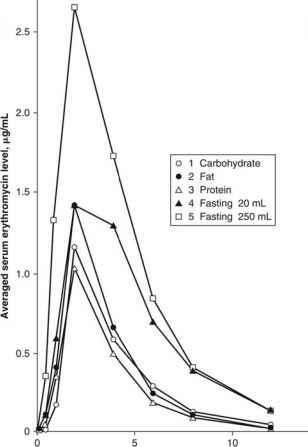 By comparing gastric absorption at pH 3 and pH 6, where surface area and factors other than pH are constant, one sees that the general principle is supported; acid drugs are more rapidly absorbed from acidic solution, whereas basic drugs are more rapidly absorbed from relatively alkaline solution. 2. At the same pH (i.e., pH 6), acidic and basic drugs are more rapidly absorbed from the intestine than from the stomach, by virtue of the larger intestinal surface area. 3. Acidic drugs are more rapidly absorbed from the intestine (pH 6), although there is substantial ionization, compared with the rate of gastric absorption, even at a pH where the drug is in a far more acidic solution (pH 3). Again, this is primarily a result of surface area differences. The pH-partition hypothesis provides a useful guide in predicting general trends in drug movement across biological membranes and it remains a useful concept. There are numerous examples illustrating the general relationship among pH, pKa, and drug absorption developed in that hypothesis. The primary limitation of this concept is the assumption that only nonionized drug is absorbed, when in fact the ionized species of some compounds can be absorbed, albeit at a slower rate. There is also the presence of unstirred water layers at the epithelial membrane surface, which can alter the rate of drug diffusion. Furthermore, the hypothesis is based on data obtained from drug in solution. In a practical sense, other considerations may also govern the pattern of drug absorption, and these include dissolution rate from solid dosage forms, the large intestinal surface area, and the relative residence times of the drug in different parts of the GIT. These factors are discussed below. In general then, drug absorption in humans takes place primarily from the small intestine regardless of whether the drug is a weak acid or base; gastric absorption, even for acidic drugs, is minimal. Water-soluble vitamins (B2, B12, and C) and other nutrients (e.g., monosaccharides, amino acids) are absorbed by specialized mechanisms, which implies membrane participation in transport and the need for energy expenditure. With the exception of a number of antimetabolites used in cancer chemotherapy, L-dihydroxyphenylalanine (L-dopa) and certain antibiotics (e.g., aminopenicillins, aminocephalosporins), the majority of drugs are absorbed in humans by a passive diffusion mechanism. Passive diffusion indicates that the transfer of a compound from an aqueous phase through a membrane may be described by physical chemical laws and by the properties of the membrane; no energy is required. The membrane itself is passive in that it does not partake in the transfer process but acts as a simple barrier to diffusion. The driving force for diffusion across the membrane is the concentration gradient (more correctly, the activity gradient) of the compound across that membrane. This mechanism of membrane penetration may be described mathematically by Fick's first law of diffusion, which has been simplified by Riggs and discussed by Benet (30,31).